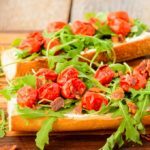 BLT Goat Cheese French Bread is made with toasted bread, garlic goat cheese spread, bacon, arugula, and roasted tomatoes. Serve as an open-faced sandwich or cut into appetizer bites. Position oven racks in upper and lower thirds of the oven. Preheat oven to 400°F. Line one rimmed large baking sheet with aluminum foil (wide heavy-duty foil recommended). Place slices of bacon on foil-lined baking sheet. Place tomatoes on a separate rimmed baking sheet. Drizzle olive oil over tomatoes and sprinkle with salt and pepper. Toss tomatoes to coat with oil. Put both baking sheets in the oven and bake for about 20 minutes. Remove tomatoes when skins begin to pop. Remove bacon when crispy or cooked to desired tenderness. Transfer bacon to a paper towel lined plate. Discard bacon grease or save for another purpose. Discard foil. Crumble bacon. Stir together goat cheese, garlic, and half-and-half in a small bowl until combined and smooth. Cut French bread in half both vertically and horizontally. Place bread slices on baking sheet. Toast French bread in the oven until lightly browned on the edges, about 10 minutes. Spread goat cheese mixture on toasted bread slices. Be careful handling hot toasted bread. Top with crumbled bacon, arugula, and roasted tomatoes. The recommended length of French bread to use is about 14 inches to yield 4 slices about 7 inches long. Increase the amount of bacon, tomatoes, and goat cheese mixture to cover longer loaf slices.